Take the coffee filter's percolator ( ie. the part with perforations/holes)sprinkle little sugar at the beginning before adding coffee powder.This helps for faster filtration of decoction.Add the coffee powder & roasted methi powder. Press it gently with ur fingers and then place the strainer.Add hot water till half of the filter.Tap it with the lid and close it immediately Wait for 10-30 mins for the first thick decoction.Reserve the first decoction in a tumbler.U can make coffee with the first thick decoction if u want strong coffee ( this is called first degree coffee,kumbakonam degree coffee). If u wanna light or medium strong coffee,then add little more water to the filter and wait for some more time to get the second thin decoction.Mix the first & second decoctions and add as per ur taste. My MIL says this method gives the best tasting coffee ..
To make coffee for one person, boil the milk and add 1.5 – 2tsp of sugar to one cup of milk.Then add the decoction as per ur taste and swish it OR add sugar and decoction in the bottom of tumbler and add milk.It will come up with a nice color. Serve it frothy !! Piping hot frothy filter coffee is ready to enjoy with ur favorite snacks !! We usually serve in traditional “Davarah- tumbler” which u can c in the picture .. I have used “Coffee day coffee powder “ with chicory.If u use INDUS or COTHAS or COFFEE DAY coffee powder without chicory add 2 tbsp instead of 1 tbsp..U can make 3 cups of coffee with the coffee powder quantity i’ve mentioned. I have used small size filter. If u use bigger ones,increase the quantity of coffee powder twice or thrice. Please don’t use the same quantity for big filters. f u have left over decoction u can keep it in refrigerator and use it the next day.But Please avoid keeping decoction for 3-4 days.It may become a poison. If u feel the decoction is brewed very slowly,tap it once on the umbrella like strainer or show the filter over the flame for few secs before adding coffee powder.I’ve mentioned to add sugar before adding coffee powder This is also for quicker brewing..
A term often heard for high-quality coffee is degree coffee. Milk certified as pure with a lactometer was called degree milk owing to a mistaken association with the thermometer. Coffee prepared with degree milk became known as degree coffee.. Yet another explanation is that, when coffee is decocted for the first time, it is called as the first degree or simply as the "Degree Coffee". This has the strongest flavour and the necessary strength to mix with milk without watering down the taste. In less affluent households, in earlier days, coffee was decocted for a second or third time from the same initial load; this became the second degree coffee and naturally, is not as strong. Affluent households drank first degree or the famous "Degree Coffee" only. Interestingly, there is a Kannada name for coffee "Boondh Bisneeru". "Bisneeru" sounds a great deal like "bisi neeru," or "hot water," thus leading to speculation that the terms are connected. Although not used currently, this was used by ladies two generations ago. The Srilankan Tamil name for coffee is "Kottai Vadineer". For cleaning the filter , drop the bottom part in hot water for few mins. Also pierce the holes with a needle to clean it. You'll need a traditional FILTER which is made﻿ of 4 parts. 1. The lid that comes on top of the percolator. 3. Strainer, this looks like an umbrella . 4. Collector, The fourth part forms the base which collects the strained decoction. Boil the milk adding water and take one cup of it. Add sugar,coffee powder and froth it.Check for taste and add more coffee powder for strength and color if necessary.I love coffee to be mild,so i add very less coffee powder. Please adjust as per ur taste.Frothy , hot instant bru coffee is ready to enjoy !! ** Please don’t add more sugar for the mentioned amount of Bru because u wont get the bitter taste and sweetness would be more.For 3 people , u can add 1 tsp of coffee powder. All the tips are so useful Chitra. Perfect first click and is a visual treat for any coffee lover. OMG ..missing the Chennai filter coffee. I never knew the use of methi powder in the coffee. Wow filter coffee hmm...i love it, soon wil by filter and my own coffee. My evening time never ends without coffee, ur pics make me tempting!! Perfect hot coffee, my day is never ending with so many cups of coffee. Lovely clicks. Omg, am missing this filter coffee very much,u r killing me with ur clicks Chitra. the day will not start without this for me chitra,love the clicks especially in pic college the ticaution is jumping rite...that is too gud. Super and lovely filter coffee !! wonderful post chitra,am very addictive to this coffee,missed it a lot...adding methi seeds is new to me!! ..i too hv the traditional filter from my granny. I have developed a taste for coffee in the past year.. thislooks delicious. Roasted methi powder in coffee, that's new to me, always a cup of filter coffee is inviting..
Would love a cup now! Lovely clicks! wow...methi flavored coffee!!! loved it !!! Wow looks super tempting..love ur stepwise! 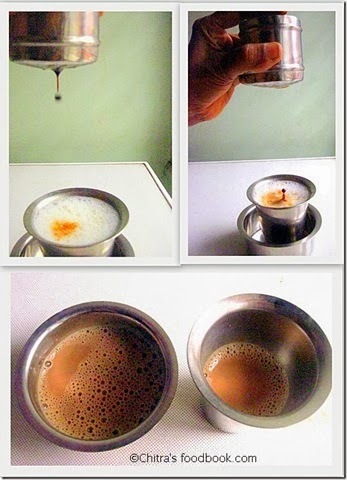 very detailed post.. love this filter coffee.. especially the first photo is really very much tempting.. The coffee looks terrific ! And many thanks for those tips. Thanks for visiting my space. Happy to follow you. Hi dear..where do i get this filter??? ?..cause im in malaysia!!! Thanks for the interesting recipe! Thanks for the interesting tips! My all time and only coffee that i drink. Yes my mil adds in 80% coffee and 20% chicory as chicory is not good for health. In shops they add 60, 40 as told by you. Finally its based on our liking.